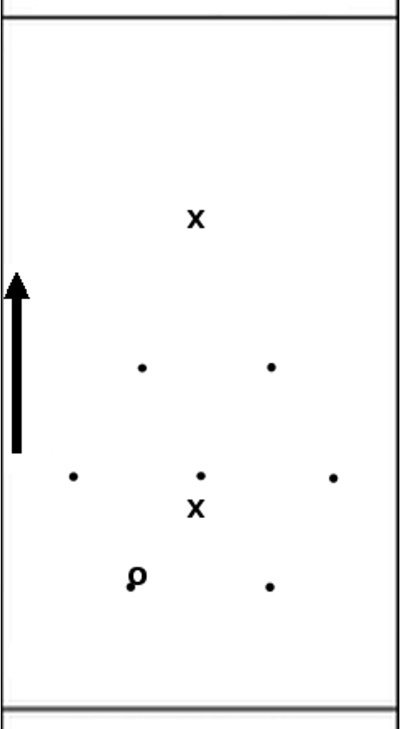 “Hex Offence” covers any offence which plays to the hexagon shape on the field as described in the “Formation” section below. Currently there is only one known offence which utilises this shape – Mexican Offence, or Mex for short – which is a flow-based offence operating on principles (as opposed to e.g. patterns). This article describes Mex Offence. This document explains the basics of Hexagon Offence in Ultimate. Hex was first played in the summer of 2012 in a pickup game in Brighton, introduced by Felix Shardlow. The strategy quickly gained support and became the favourite amongst many players, who recognised its potential and enjoyed its freedom. These players would each feed ideas back and forth, discovering new ways to unlock its potential, and figuring out the most effective principles which should be applied. A history of how it stood up to tests in it’s early days is at the bottom of this page. This offence can be played effectively in high level Ultimate, or be the first offence taught to beginners – who will quickly pick up on the fundamentals of the game with a style that encourages involvement and offers constant opportunities to contribute to plays. Hex can also be played with fewer players – although the overall shape changes, the principles remain the same and the effectiveness is not compromised. This doc is written so a beginner can pick it up and understand how to play offence in Ultimate without any prior experience. Experienced players may have picked up habits and principles from other offences which can hinder Hex, so clear your mind and try not to make any assumptions. The information in this document is very basic – deliberately open to the interpretation that best suits your team. Firstly, this formation is not a structure which must be strictly followed at all times – it is a guideline for the shape the players should be looking to maintain during fluid play, or the areas which players should be aiming to move towards / to clear for team mates – a meta-structure, if you will, to keep in the back of your minds whilst the offence moves fluidly. Players could either be taking the initiative and moving into / clearing space at all times, sticking more rigidly to positions, or running set plays – this depends on the style of your team. The disc should be on the edge of the formation – this prevents surrounding the disc, and gives continuation options after the first pass is made. The shape extends from the disc towards the centre of the space available – so when the disc is on the sideline, the formation extends directly off the line into the centre of the field. This animation shows how the shape is applied when the disc is in different field positions – essential viewing. The shape consists of six equilateral triangles creating a hexagon. The use of triangles means players are spread across the field in the most efficient manner – each player has as much space as possible, whilst remaining connected to as many team mates as possible. Maintaining these triangles and thus the ‘connections’ between players is crucial to the effectiveness of the formation – if disconnected, flow will stutter and may stop. The distance between each player should be equal distance to the average player’s comfortable, reliable, and accurate throwing distance – usually between 5 and 15 yards. The triangles are the crux of the shape so must not be neglected – the overall formation acts as a guideline for the space we should be looking to use during fluid play. How the movement from the Hex setup works is largely down to how your team wants to play. Expansive moves create space which can immediately be used by the surrounding players, so can be used to initiate play. Moving rapidly to the end zone is possible from many positions on the field, and the space directly around the disc is always available to be used. Give and go moves work well, and set plays are possible in every situation – three players cutting in a triangle shape, for instance, presents three viable options every couple of seconds. For efficient movement when the disc is in flow, a few rules of thumb can help. If the disc is flowing up the sideline, the formation should ‘roll’ up that sideline – players behind the disc should push out wide away from the disc and then fast downfield, and players in front of the disc should attack the space in front of the disc on the active sideline – as per this animation. If the disc is passed to the central player, players behind the disc (surrounding it) should push wide and downfield immediately, and players downfield should look to move into the space created in the centre, in front of the disc. This animation shows movement after a simple pass to the central player, and this animation shows movement when the central player receives the disc towards the side of the field. Scoring usually happens in one of two ways: (1) from a deep throw, or (2) from flow towards the end zone. Static, stop-start situations near to the opposing teams end zone are difficult due to the defenders having a very small space to cover – the deep throw is no longer a viable threat. When a comfortable distance away from the end zone, deep throws are possible from many positions, and rapid moves to the end zone are able to come from almost any player at any time. Flow towards the end zone can be started by flowing with the disc in any direction, moving the defenders out of position, and then taking advantage of the space to generate a scoring opportunity. If flow stops without a score being generated, then the team should focus on re-starting the flow – either by moving the disc across the field, or – more easily when very near the end zone – by flowing back away from the end zone. After flow away from the end zone has been achieved, once again the deep throw will be a viable threat (assuming your team has retained their shape), as well as the possibility of re-generating flow towards the opposing teams end zone. The ideal distance to which you should flow away from the end zone depends on the players on your team – far enough so that all defenders are out of the end zone, but not so far that your players cannot reach the end zone with a long throw. The Hexagon Offence was created by Felix Shardlow in 2012 and the original content can be found here: http://goo.gl/miR1Jj. Felix had many influences in the 12 years he played Ultimate before writing up Hex, including strategic talks with Sam “Scando” Webber, reading content from Jim Parinella, but most notably with regard to Hex was Frank Huguenard, who would persistently post on forums about how antiquated current offensive thinking in Ultimate was, and relentlessly promote his Motion Offense. Although Hex was experimented with occasionally by the Brighton City offence line through 2012-2013, it was only at UKU Tour 3 2013 where it blossomed. The Brighton City offence line decided to come straight out with it in their first game, against Euro Champions Clapham – who beat Brighton 15-8 at UKU Nationals 2012. Clapham started out with man-to-man defence, but Brighton scored relatively easily with long throws. Clapham then threw a tight zone defence – but without modifying their offence, Brighton scored in a few passes. Clapham then put on a loose zone, and Brighton scored in 5 or 6 passes to make it 6-6. Although Brighton’s D line hadn’t converted any turns, Clapham felt like they were on the ropes, called their second time-out, and came out with a very physical, tight man-to-man defence. They edged the game away, winning 15-11 in the end – the best result Brighton have had against them for years. After the game, Marc “Britney” Guilbert – Clapham and GB Open captain – said how impressed he was with the way we created and used the space on the field, that we were doing it in a way which Clapham aspired to. Brighton City finished 3rd at UKU Nationals 2013 using this offence 90% of the time on both lines. However, the offence is not limited to top-level play. The principles at work in Hex are more similar to other sports than any other offence in Ultimate, and Hex has been easily and successfully taught to university freshers from both Sussex and Brighton Universities – new players who have only ever played Hex are already showing a great understanding of Ultimate and excelling in the Club scene. In 2014, Brighton City’s play has become more ingrained – our movement within Hex requires less thinking and happens more naturally, and as such Hex was a big part of our taking Clapham’s D line to sudden death at Tour 2. Brighton continue to play the offence through the 2015 & 2016 seasons, finishing 3rd at UK Nationals 2015. In 2015, the Great Britain U23 Mixed team played solely Hex at the World Championships in London. Beating Japan and runners-up Australia along the way, they finished a very respectable 5th. Full game footage of Hexagon Offence being played is available here – see any of Brighton City’s games from UKU Nationals 2012/13/14, XEUCF 2013, EUCF 2014, or any Sussex Mohawks 1 or Brighton Panthers games from Uni Regionals 2014. For clips of Hexagon Offence see the Hexagon Ultimate YouTube channel – here are some samples from the channel of Hex in action, taken in 2013.